I'm a Fitbit user. Are you? I'm a Fitbit user. I lost 30 lbs in 3 months. I want to lose another 5 lbs before the end of this month to make it 35 lbs. YES! I can do it! My goal for now is to reach 200 lbs by July 1st. That's a lost of 15 lbs just this month alone. That's 2-3 hours of intense workout for at least 5 days a week. Right now, I'm focusing strictly on cardio to reach my goal but will switch to strength and cardio training after I reach my goal. My cardio workout is 30 minutes on the erg (indoor rowing machine), 30 minutes on a recumbent bike, and 50 minutes on the treadmill. There's no rest between workouts. All workouts are at full throttle (as far/fast as I can go). The idea is to get my heart rate up as much as possible to burn calories. Basically, it's a company that sells a handful of products to help you stay active and lead a healthier life. All their products give you access to their site Dashboard which gives you a history of your daily activity (exercise), calories burned, steps walked, and floors climbed. You can add friends to share your progress. It's a great team effort. Everyone in the group ends up motivating each other. Their products range from a wristband, clip-on trackers, and a scale. Currently, I'm only using the scale. The scale is great. It recognizes about 8 people. It measures weight, BMI, and % body fat. It automatically connects to fitbit.com via WIFI. My wife is using the One Wireless Activity - a clip-on tracker. I'm holding out for the wristband which is currently sold out. My 2 boys and brother also workout with us. Never give up on something you desire ... push yourself ... don't expect someone to things for you. As a group, we are also planning to attend our first Spartan Race later this year. I want to teach my boys how to become winners and still be humble. I want to teach my boys how to become winners even after failing. I'm on a roll and just wanted to share it with you!!! Are you a fitbit user? Hey good for you! I am a member of My Fitness Pal online and a lot of them use fitbit. I'm thinking about it bec. doesn't it go w/ you as you live out your life and help you keep track of everything? Yes, it goes with you. You can have the clip-on or the wristband. Hey Joe - wow-- you are doing fantastic. And since I know you, I can state what a great example he is to his sons. Great role model. I had a Fitbit Flex which i ended up sending back as it just didnt include enough info on the wristband itself. And..since you need to wear it on on your nondominant wrist I wasnt able to wear a watch. I have a Nike Fuelband now and since it contains a watch, it is working much better. Hmmm, I never thought about the watch. Because I'm so cheap I ended up buying the fitbit scale. I purchased it because it recognizes up to 8 users. Plus, I needed a new scale. Anyway, it connects to fitbit via WIFI. Each time someone gets on the scale it sends that information to fitbit. Basically, we have a history of our weight loss/gain. This information along with our manual exercising input provides us with a lot of valuable data. The whole family plus my brother are active users now. My wife is the only one with a fitbit clip-on. If you do not plan on exercising much but just walk than I recommend the clip-on or wristband. This will track how many steps you have taken throughout the day. This will help you lose weight, set goals, etc. At the end of the day, it doesn't matter which brand (fitbit, nike, jawbone, etc) you buy. These "activity trackers" really do help motivate you. If you want to lose weight I highly recommend getting one of these. I recommend getting a group of people to join you. The more people you have in your group the more motivated you will be. It has worked for me which is why I posted this. 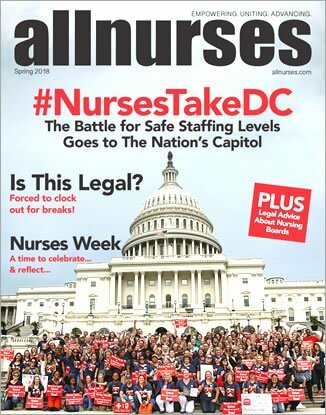 I wanted to share my excitement with the allnurses community!!! I now weigh 198.8 Lbs. I took a week off for the holidays, etc. I'm toying with the idea of buying one of these....I dunno. I'm cheap lol and I'm already pretty good about pushing myself workout wise. There's a new fitbit coming out soon called the fitbit Force. I just got my Fitbit yesterday. I know it's old hat, but I want to make this the year I get healthier- mind, body, finances, home, you name it. Hoping this provides the motivation and reinforcement I need- I'm really not the type for workout buddies.